Well, that was positively awful. Of course, the current trend of making a comedy as raunchy as possible by cramming it full of dirty jokes involving excrements and unusual sexual positions has been going for quite a while now, so you can hardly blame this Vacation for that. It's not like the original movie refrained from such shenanigans. But the level of said gags is just abominably low here, making it painfully unfunny for the most part. Too bad, because I know the lead Ed Helms, of Hangover fame, is capable of funnier routines. But even he is hopelessly lost somewhere between the rim jobs and Chris Hemsworth's erection. You got a bad thing going when the holiday car is funnier that the characters driving it. But at least the car doesn't make poop jokes galore. This vehicle of Albanian make is just loaded with silly gadgets and awkward options. Not all of them a guarantee for success, but at least I chuckled over the navigation system's sultry female American voice accidentally being replaced by a seemingly outraged Korean counterpart. If translated however, it would no doubt be revealed to get in line with the rest of the ample obscenities the script contains. As with most remakes these days, this one wouldn't have been missed if it wasn't produced at all. However, recycling the original film's plot and adding Horrible Bosses or We're the Millers type jokes to it likely saved the studio a few bucks. 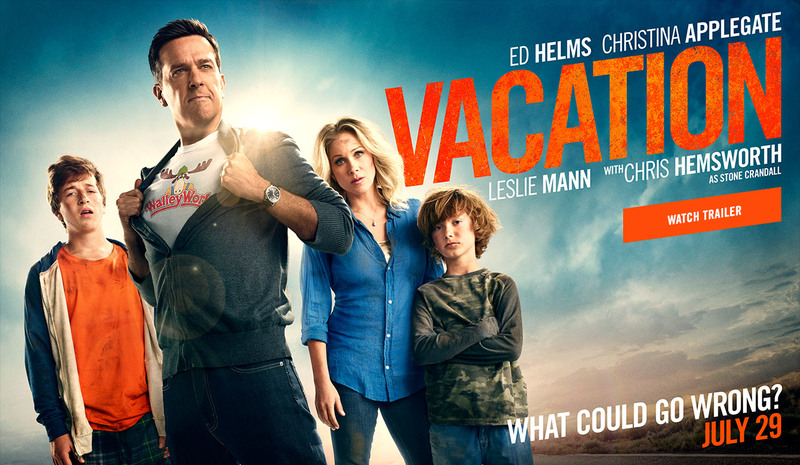 The story is mostly the same as its predecessor's, while some of the situations are even lifted verbatim from some of the other Vacation movies from the Eighties. It's not like this is that well known a franchise these days, so who would know, right? But if you acknowledge the status of this film as a remake by making jokes about that very fact in the actual film, you sure run the risk of people checking out the previous installments and finding out just how lazy the writing is this time around. Even such references to the original are hardly an inspired move. Remember 21 Jump Street addressing its status as a reboot by literally saying nobody at the top has any better ideas than just regurgitating old notions ad nauseam? It's a funny line, until you understand just how poignantly true it is. We don't need to hear the same argument here to hammer the point home. The movie is unhilarious enough without reminding us a better film with the same name and the same plot was produced thirty years ago. Or that we're likely to see another movie with said name and plot in a few more decades. The kids in this feature definitely appear stupid enough to make the same mistakes all over when they grow up. Luckily, this Vacation will be swiftly forgotten. It'll prove a lot harder to get that obnoxiously catchy song Holiday Road out of our heads.